Student-athletes, coaches, and faculty athletics representatives play a critical role in creating an environment that supports the mental health and well-being of college athletes. That’s why the Sport Science Institute developed web-based educational modules to help normalize and destigmatize mental health help seeking for college athletes. 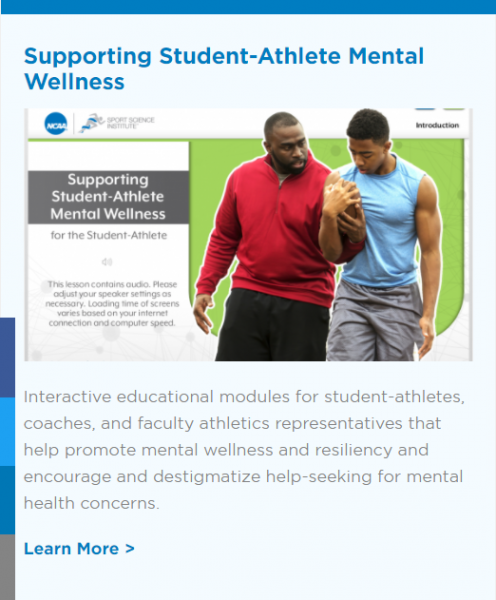 If you are an NCAA student-athlete, coach, or faculty athletics representative, the interactive modules will provide information to help you promote mental wellness and resiliency on your campus and to encourage and destigmatize help-seeking for mental health concerns.